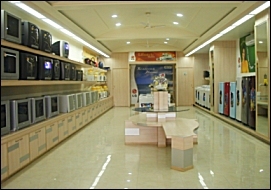 LG Electronics state-of-the art Showroom with almost full range of LG products.such as Colour Televisions, Washing Machines, Air-Conditioners, eco-friendly Refrigerators, DVD players, Digital Audios, Vaccum Cleaner and Microwave Ovens. At showroom finance facility from GE Countrywide is also available for cusomers requirement.So low installment that fits your budget. Easy approachable being situated in the heart of city,and huge parking space make an aid and improvement in customer satisfaction.